Regardless how you submit your file, you should receive an email confirmation within a few minutes of submitting your file. If you do not receive your confirmation, you should immediately (i) check your spam folder, and (ii) log into your account to confirm that we have received your file. If you do not see your file when you log in, you should contact us immediately. If you dictate by phone, you may dial any of the following phone numbers. When prompted, enter your 10 digit account #. Select Rush, Regular or Super ­Rush service. Begin dictating at the tone and press any key (or hang up) when finished. You will then be asked if you wish to resume or begin a new job. You may continue dictating without having to call back. If you need to pause while you gather your thoughts, the system will give you one (1) minute of silence before you are disconnected. Any sound you make should start the one ­minute timer over again. A. (877) DICTATE (877) 342-8283 Press "1" to dictate. B. (866) 995-3000 Press "1" to dictate. C. (888) 222-8037 Press "1" to dictate. D. (847) 983-3001 (Local #) Press "1" to dictate. E. (44) 203-642-4230 (UK) Press "1" to dictate. F. (52) 558-526-1219 (Mexico City) Press "1" to dictate. G. (855) DICTATE (855) 342-8283 Press "2" to dictate. Instructions for using the 855 number are at http://idictate.com/855.php. Contact Support if you wish to use this number. You can now use our iOS and Android apps to record and submit your audio files. 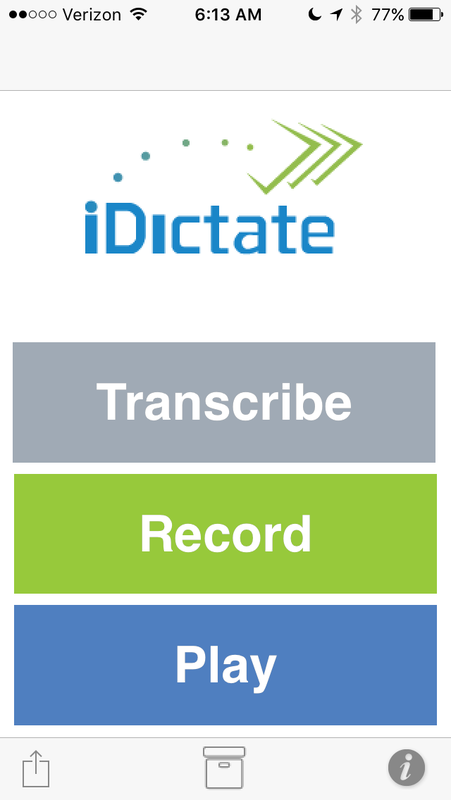 It is super easy to use and files will be uploaded directly to your iDictate account. When using our app, you can (i) select Rush, Regular and Super Rush, (ii) provide instructions to the typist, and (iii) specify what template we should use. Files are delivered to us from the app by email. Before using the app, make sure your first enter (in Section 4 of your iDictate Profile) the email address(es) you will use to send your files. If you don’t fill out Section 4, we will not receive your files. Before emailing files, make sure you first enter (in Section 4 of your iDictate Profile) the email address(es) you will use to send your files. If you don’t fill out Section 4, we will not receive your files. Remember that files larger than 25mb cannot be emailed; instead you will need to upload them directly to your account. When emailing a file to iDictate, you cannot include any written instructions, as the emails are not seen by a human person. Most email service providers limit the size of email attachments. For example, Gmail limits each email message to 25 mb. You may upload multiple files at one time. Most voice file formats may be submitted for transcription (i.e. WAV, DSS, MP3, AIF, AIFF, AMR, MSV and so on). In addition, you may upload PDF or TIF files to be typed. To upload files, you must log in to your account and select "Upload Files". You should be able to upload virtually any size file. If you choose (b) "Upload Large File", and your file is > = 60 minutes in length, the file will automatically be split into ~30 minute increments with no piece shorter than 5 minutes, so that your file can be assigned to multiple typists at one time, which will frequently result in faster service. If you have a large file but choose (a) "small-medium file", your file will not be split. If you select "Super Rush", and if file > = 30 minutes in length, your file will automatically be split into 15 minute increments, with no piece < 5 minutes. When files are split: each increment will overlap by five seconds to ensure that all the words are captured. Your completed transcripts will match the 15 minute audio increments, and will be delivered to you separately. You will then need to assemble the transcripts into a single document and remove any duplicate words caused by the five second overlaps. If you do not want your file split, select "Upload Short-Medium File for Transcription". YouTube and some other video formats can be submitted into the iDictate platform automatically. Enter the YouTube URL in the space provided by iDictate, after clicking "Upload File". Due to the large size of video files, your file will be split into 15 minute increments and then converted to audio. The chunks will then be assigned to multiple Typists with a goal of faster service. Each increment will overlap by five seconds to ensure that all the words are captured. Your completed transcripts will match the 15 minute audio increments, and will be delivered to you separately. You will then need to assemble the transcripts into a single document and remove any duplicate words caused by the five second overlaps. The files will be numbered sequentially. If you want our typists to use templates, you only need to upload each template to your account one time. You do not need to submit the same template with each job, but do make sure your new templates have been uploaded to your account before you upload your audio file. Please log in to your account to ensure that we have correctly uploaded your old templates to our new platform. If not, you should upload them now. If a template is required, select it by name at the time of uploading a file. If dictating by phone, the template name should be identified at the beginning of the recording. If using the Idictate iPhone app, the name of the template should be entered in the space provided. Fax your notes to (800) 397-4495. Make sure your cover page contains your name, account #, phone #, and indicate whether you want Rush, Regular, or Super Rush service. As a last resort, upload file to our HIGHTAIL account. (for files up to 2 GB) Be sure to provide your name, account #, phone #, and desired service level (Rush or Regular), and send us a separate email message any time you upload a file to Hightail. Copyright© 1999-2019 iDictate, All rights reserved.